An Art Camp and Photo Exhibition was held on 12 th January 2002 at New Delhi, to create environmental awareness among the less privileged. IndianWildlifeClub.com along with Mantram Art Foundation and Nehru Bal Samiti sponsored the Art camp for underprivileged children on the theme 'Wildlife and Environment'. The best paintings were awarded prizes and exhibited in the Russian Cultural Centre. On the same day IndianWildlifeClub.com organised an exhibition of wildlife photographs at Parivartan Art Gallery. Four members of IWC.com, Jayant Deshpande, Saurav Ghosh, Rahul Dutta and Anantika Singh exhibited their photographs. 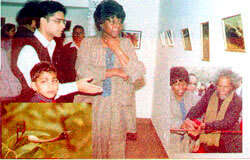 The picture shows Rahul Dutta presenting his photographs to Ms Erma Manoncourt Dy. Director,( Prog.) UNICEF who inaugurated the function. Insets: the inauguration of photo gallery by the Chief Guests, Ms Manoncourt and Shri. V. Viswanadhan ( Eminent Artist based in Paris). 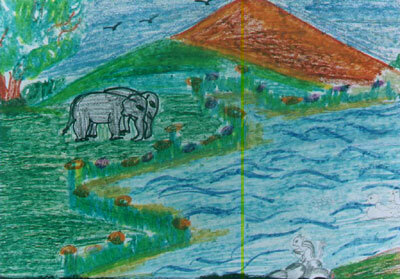 One of the paintingswhich won a prize by a student of "Salaam Balk Trust" is shown here.